Mahathir Mohamad might be back on the campaign trail in opposition but this doesn’t appear to be an obstacle to the present government. 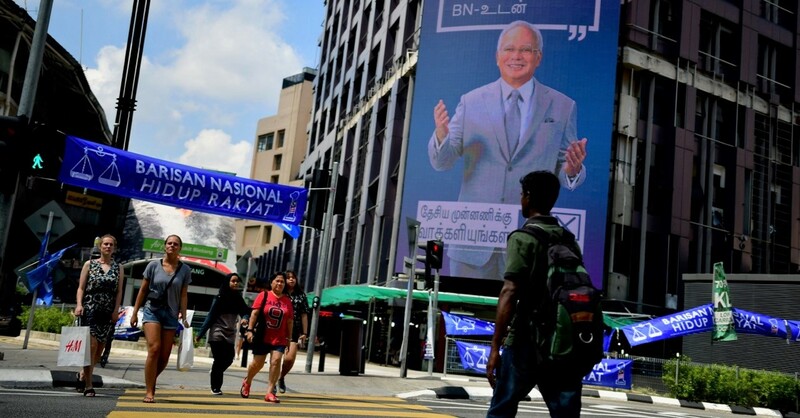 Not many people give Malaysia’s opposition a chance of ending the 13-election winning streak of the ruling Barisan Nasional party when the country goes to the polls on Wednesday. “For a government to rule for 60 years in a democracy, it shows there is something wrong with the country,” said Harindra Singh, a volunteer canvasser with the Democratic Action Party, the largest of four parties that make up the opposition coalition. Barisan Nasional, or the National Front, has governed Malaysia since independence in 1957. In the last elections, held almost five years ago, Barisan Nasional lost the popular vote by 3%, but still won enough parliamentary seats to form a government. In the years either side of that vote, opposition parties staged huge demonstrations in Kuala Lumpur calling for reform of the electoral system, which they said was gerrymandered to the point of rigging. Reform came, but not the kind the opposition wanted. “Redelineation”, as it is called, seems to have altered constituencies in a way that makes it even harder to see an opposition win. This means that the urban areas, where the opposition is strongest, in some cases require three to four times more voters per elected MP than in rural areas, where the governing National Front has long been unstoppable. But in the years since the last election, the opposition has also transformed. The most obvious change has been the return to politics of 92-year-old Mahathir Mohamad, a former National Front leader and prime minister, to lead the opposition campaign. Mahathir defies his age with daily speeches in front of thousands of people and campaign appearances in the rural Muslim and ethnic Malay regions where Barisan Nasional usually wins easily. The opposition is expecting to do well in urban areas, especially among the 25% of Malaysians who are of Chinese descent, but with allegations of gerrymandering, they cannot win outright unless Mahathir’s appeal draws enough Muslim Malays away from the government. Prime Minister Najib Razak has campaigned on his economic record, asking voters not to risk change. “If we make a wrong choice [all] that we have planned so far will be affected,” he said on Friday, speaking in Hulu Terengganu in Malaysia’s north-east. Malaysia’s GDP per capita is just under $10,000 per person, according to the World Bank, ranking it among Asia’s better-off countries. Although it is still some way off the income levels of Japan, South Korea, and neighboring Singapore, the economy is growing at about 5% a year. The opposition has homed in on a sales tax, or GST, of 6% that was introduced by the government three years ago. The opposition has warned average incomes are not yet high enough to justify the levy, and has promised to abolish the sales tax if it wins office. But this pledge has in turn seen the opposition argue that revenues will fall if the tax is scrapped. Najib has also been accused of hypocrisy over tax, fending off accusations of mismanaging a state fund known as 1MDB and of receiving the equivalent of around $700 million to personal bank accounts – money Najib described as a Saudi Arabian donation. In 2009 Mahathir, then revelling in his post-retirement role as the éminence grise of National Front politics, backed Najib’s elevation to the prime minister’s job. But Najib’s alleged impropriety drove Mahathir to defect to the opposition. A notoriously acid-tongued premier when it came to dealing with critics of his own authoritarian rule, Mahathir has lost little of that edge, regularly lambasting Najib as a “thief” once the 1MDB allegations emerged. Addressing a rain-sodden campaign rally in Kuala Lumpur on 2 May, Mahathir declared that he regrets his role in helping Najib become prime minister, describing it as “the biggest mistake that I have made in my life”. Najib fired back, calling Mahathir a “recycled candidate” and gleefully reminding him that as prime minister Mahathir used draconian laws to jail critics, including some of the people he is now allied with. Harindra Singh, the opposition canvasser, agreed that Mahathir ruled with an iron fist, but said “at this point in time he has shown he has repented”. Another opposition supporter, giving his name as Sky Chin, said that he thinks the government can be beaten. “It is possible, we have to hope,” he said, referring to the opposition coalition’s name – the Pakatan Harapan, or Alliance of Hope. But “satellite” launches could disguise more missile tests.